Our product range includes a wide range of kalre active lightning conductor. Kalre Active Lightning Conductor protect actively, on a large scale and are reliable. 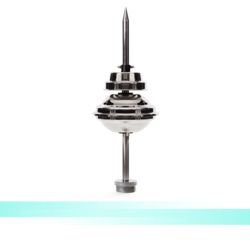 The ion Generator inside allows the Lightning Conductor to intercept and catch a potentially dangerous Lightning Strike earlier than simple rod Conductor and ground it safely. Looking for “Kalre Lightning Conductor”?